This entry was posted in Market What's Happening on June 17, 2017 by williamsfarm. We’ll be away from the Barrie Farmers’ Market on Saturday June 17th, returning on June 24th. Sorry to be away for two weeks in a row, but a family matter calls. It’s been busy on the farm this week. The beds for the next planting of carrots and beets are done and being irrigated to sprout the weeds in the beds before we plant the tiny carrot seeds. 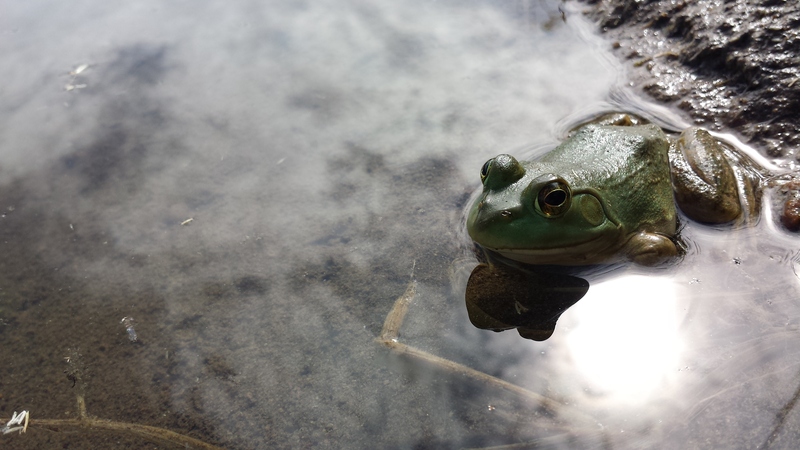 I’ve found a friend around our pond as I visit it for irrigation. See a picture of my green friend below! Next week I’ll have garlic scapes at market. They are just starting to show now.